J.C. Penney is aggressively working to get itself back on solid footing. The retailer has been struggling for months as Johnson's ambitious turnaround efforts (store within a store anyone?) fell flat, and sales flagged. With Ullman taking up the reins, analysts are hopeful the ship will right itself sooner rather than later. Deutsche Bank reportedly called Monday's move a positive for J.C. Penney, saying the retailer wouldn't likely need to sell a great deal of new stock to meet its financing needs. 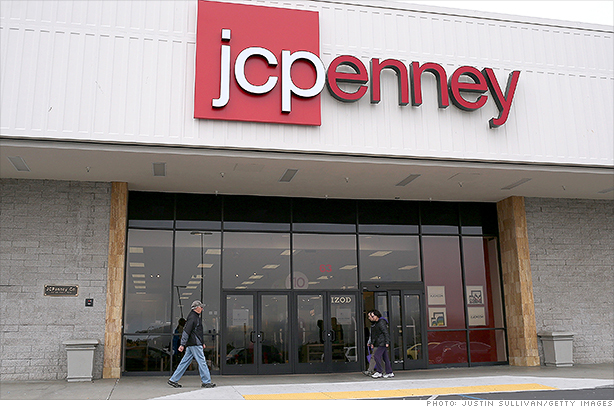 Shares of J.C. Penney, which have slumped 25% this year, bounced higher Monday. StockTwits traders were also cautiously upbeat about the latest moves. I'd like to point out that while it's true, pressure has been exponentially mounting, Ullman isn't wasting any time. One of his first phone calls was reportedly to Macy's (M) CEO Terry Lundgren to try to resolve the Martha Stewart (MSO) dispute. The last thing J.C. Penney needs right now is a lawsuit. Penney won Round One, when a judge said the retailer would be allowed to sell certain Martha Stewart products in its stores. That's certainly good news. Considering the number of layoffs under Johnson, employees (and investors) may be breathing a sigh of relief here that Ullman will be able to get J.C. Penney back on track. $JCP 10K: "borrowing capacity under our revolving credit facility..varies according..inventory levels, acct receiv, credit card receivables"
That seems pretty logical to me. And I don't think there's any cause for alarm. It seems like Ullman is taking measured steps. $JCP is down less than 1%... enough with the sky is falling posts. Amen to that. The stock will probably be choppy for awhile as J.C. Penney works to get its sales back on track. So I wouldn't write it off just yet.